Composed by Timothy Carpenter. With Standard notation. Falls House Press #4F-TC1. Published by Falls House Press (PR.4FTC1). Here is a set of pieces that are just perfect for any quartet, whether performing in church services or on the concert stage. These three short works are arrangements of the hymns "Jesus, Lover of My Soul" (Aberystwyth), "Come Ye Sinners, Poor and Needy" (Restoration) and "O Worship the King" (Lyons). They were each designed to stand alone as preludes in a worship setting, but will also work all together as a hymn tune set in a concert. No matter how you choose to use these arrangements, the variety of styles (such as 5/4 swing, canon, theme and variations, and imitative polyphony), as well as a novel approach to church music, will enthuse both the listener and the performer. 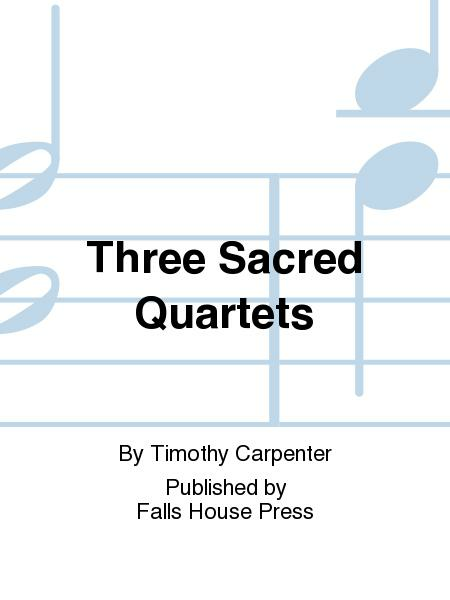 Designed for upper high school level players and above, these Three Sacred Quartets are sure to be some of your favorites for years to come.